Philosophical anthropology—the basic science of who we are as humans—is crucial bridge the divide between the social sciences with philosophy and theology that characterizes most modern universities. In this talk, I will discuss how studying personalist philosophy led me to adopt a narrative approach to the study of the human person in my research on suffering and resilience. Making education person-centered also requires understanding our total humanity. I will share how I help students integrate what they learn in the classroom to the the big and small daily practices that make up a fulfilling human life. Suggested reading for the talk can be found here. 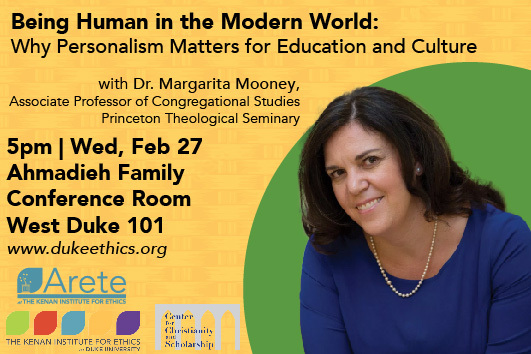 Dr. Margarita Mooney is a scholar, educator, mentor and public speaker with interests in integrating sociological, philosophical and theological approaches to virtues and the common good. As an Associate Professor at Princeton Theological Seminary, she teaches classes such as philosophy of social science, religion and social theory, and intentional communities. She was on the faculty of sociology at the University of North Carolina at Chapel Hill from 2007-2013 and Yale University’s faculty of sociology from 2013-2016. For her most recent research project, she analyzed survey data and conducted in-person interviews about resilience and faith with young adults who have experienced traumatic life events. In 2016, she started Scala Foundation, a nonprofit dedicated to reinvigorating classical liberal arts education and preserving the ideas and practices necessary to maintain communities of solidarity that uphold personal freedom. Through Scala, she has led numerous student discussion groups about the art and science of happiness, and guided students towards practical applications that improve their wellbeing and that of others around them. Scala’s reading groups, dinner seminars and travel events emphasize hospitality and friendship, aiming to help students connect their intellectual development with character formation and generating transformative educational experiences and authentic friendships.